In this last legislative session, one of the bills passed concerned the labeling of produce as “Connecticut Grown” and “Locally Grown”. This new law which will take effect on October 1st increases fines for mislabeling products at farmers markets from $25.00 to $100.00. There had been complaints that some sellers were advertising out-of-state products as local. 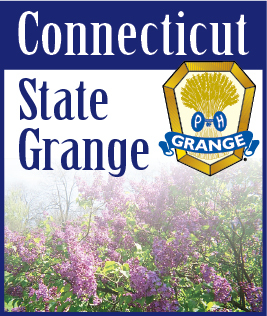 With this change in the regulations, sellers who claim that their vegetables have been raised in Connecticut, as “Connecticut Grown”, will be required to post a sign at the farmers market stating the name of the grower and the location of the farm. Any vegetables being sold at any markets that are grown within a 10 mile radius of that location can be labeled as “native”, “native grown”, “local” or “locally grown”. There are some Granges that sponsor farmers markets and should be aware of these changes in the labeling law. Anyone who frequents the local farmers markets should also be aware of these changes. The Department of Agriculture will issue one warning before posting fines to encourage individuals to comply with the regulations. Last year I mentioned one of the state Department of Agriculture grants that allow municipalities and non-profit organizations to create or expand agriculture related programs and activities. In a recent CT Weekly Ag report put out by the Department of Agriculture they highlighted an organization that took advantage of one of these programs. Using an old banquet hall, the group created a commercial kitchen and community garden. The non-profit CLiCK (Commercially Licensed Cooperative Kitchen) opened this last spring. CLiCK is located in the town of Windham and took advantage of the State Farm Viability Grant along with other state and federal grants. It opened its doors to farmers, food producers and anyone else interested in making or learning about food preparation with freshly grown ingredients. A major focus is to support the farm-to-table opportunities as well as education and training in nutrition and culinary arts. Kitchen and shelf space are rented by the day or month with the fees helping to sustain the facility. One client that was mentioned in the article sells hotdogs out of a trailer and is now able to expand her menu by using the kitchen to include healthy options. The facility has also installed some bee hives, fruit trees, berry bushes and a composting tank. A common theme was to address the need for people to improve their health through better eating by teaching people to cook for themselves.